Like one thousand times before, I reached the end of the book completely lost though. Should I make a crumble, crème bavaroise, brandy snaps, tuiles? The fact that I'm extremely reluctant to go shopping for ingredients also complicates my choice. Sabayon was the end result of this struggle. 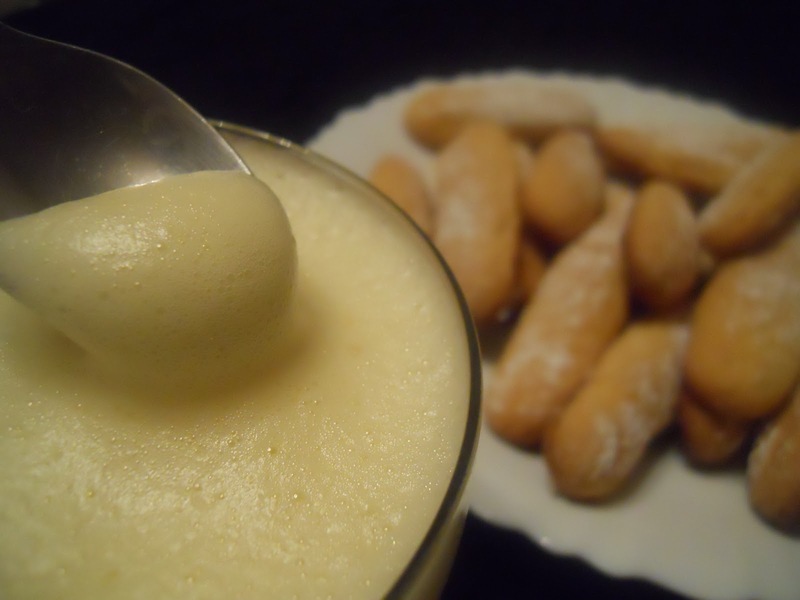 It's a truly beautiful Italian cream made of egg yolks with sweet white wine. It's amazing in its very idea: you beat the yolks with sugar on a very gentle heat, slowly adding Marsala wine. The thing turns into feather-light pale yellow cream with incredible flavor. Later I also made Savoiardi biscuits (ladyfingers) to complement it. In a heat proof bowl combine egg yolks with sugar. With electric mixer beat till the yolks turn into foam and their color turns pale. Set the bowl over a pan with simmering water. Make sure the bowl doesn't touch the water. Here's where the magic starts. Slowly and gradually add the wine while constantly beating. The cream's volume will double. Continue to beat till the cream is thick and the color is very light. Remove the bowl from heat. Immediately pour the sabayon into dessert glasses and serve.